In temple days, sweet incense containing Frankincense was placed on the Inner Altar of the Tabernacle and burned morning and evening. Frankincense was also used in certain sacrifices, making them a "sweet smelling aroma to the Lord." The gnarly Frankincense trees grow in land with very little soil and out of weather-worn marble rocks along the coastal areas of Oman, Somalia and Yemen. Young trees furnish the most valuable gum, amber in color and extremely aromatic. Resins begin to crystallize almost immediately after harvesting, appearing translucent as the hardening takes place. 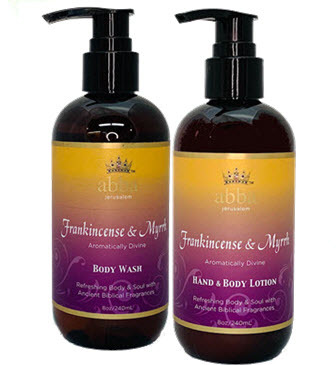 The exotic, spicy scent of Frankincense is truly captured and enjoyed in these products!